In order to effectively evaluate the proposed best practices, PRO11 activated its Best Practices Board pursuant to General Order No. 1165 dated November 14, 2017. It is headed by the Regional Director, Chief of each division as members and Chief, Human Resource and Development Doctrine Section as the secretariat. Oplan Liwanag Provide rehabilitation program to drug surrenderers including livelihood trainings, marriage counselling, etc. Detainees Safety Deposit Box was conceptualized by PSSUPT DARIO L Gunabe, the former Provincial Director of Davao Sur Police Provincial Office. It is created to have proper storage box for the detainees belongings, to eliminate the incident of lost belongings of detainees and to avoid commission of crimes inside the detention cell. The jailguard will be the primary custodian in the maintenance and implementation of this project. Upon the entry of detainees, the jailguard fills-out the checklist containing the surrendered belongings for safekeeping which will be given to the relatives upon their visits. Currently, the Detainees Safety Deposit Box is installed in all of the municipal police stations of Davao Del Sur and Davao Occidental Police Provincial Offices while the other Police Provincial Offices and City Police Office is under the process of setting up the project on their respective police stations. 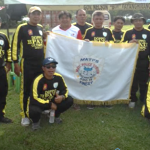 Barangay Peacekeeping Action Team (BPAT) Olympics was designed to showcase acquired trainings of Barangay Peacekeeping Action Team (BPATs) or impart to them basic knowledge and skills as force multipliers. 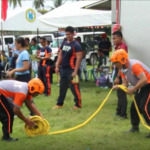 BPAT Olympics is a sports competition among BPAT members and barangay officials in the performance of their duties and responsibilities such as on assistance of law enforcement, disaster management (search and rescue operation) and crowd control management (local and national celebration). At present, PRO 11 subordinate units are directed to replicate this project but the date in the conduct of this project will depend on the unit commander’s discretion. PRRT! STOP! or Search for Ten Outstanding Policemen of Davao del Norte is a coordinated undertaking among the PNP-PAC (Philippine National Police – Provincial Advisory Council) of Davao del Norte, the Police Provincial Office of Davao del Norte and the provincial government of Davao del Norte. Through the facilitation of Hon. Shirley Belen Aala, PAC Chairman and Davao del Norte’s Provincial Board member, a resolution has been passed ensuring the monetary prize worth Php 250,000.00 will be sponsored by the provincial government every year for all the awardees . c.) To help promote that police work is a shared responsibility between the policeman and the communities in Davao del Norte. Save and Educate a Child- The rising crime incidents involving minors prompted the conceptualization of this initiative. The program started last 2003. 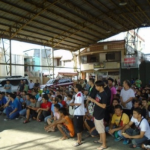 This project is an alternative strategy of Davao City Police Office Police Staiton1 (Sta. Ana) to those minors who have committed crimes which are still covered by the Juvenile Justice System. The primary goal of this project is to save minors from committing more crimes and give educational assistance to those Children in Conflict with the Law (CICL), Out of School Youth (OSY) and Children At Risk (CAR) to have brighter future. 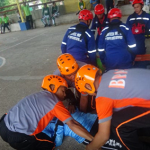 One of its breakthrough accomplishments is the successful story of PO1 Weltor H. Helborion, presently assigned at Davao Norte Provincial Force Maneuver Company. He came from a broken family leading him to become one of the Children In Conflict with the Law (CICL) in the area of Boulevard, Davao City. Living without the guidance of his parents and by the influence of his cousins prompted him to join the “Inosenteng Demonyo Gang” believing he will find comfort and happiness in this group. At the age of 10 years old, he was rescued by police officers due to violation on curfew on minors. He was adopted and was given financial assistance by the police officers of Davao City Police Office. Every personnel deducted twenty (20) pesos from his or her hazard pay in order to provide Helborion financial assistance from secondary to college education. In 2011, he graduated from college and took up the Licensure Examination for Criminology. Luckily, he passed and a year after, he was recruited as police officer and belonged to Class 2012-02 “Bagasik”. He owes much of his success to the Save and Educate a Child program of Davao City Police with the endless and genuine help of PSI ELIZA C RAMIREZ. Through the collaborative effort of the stakeholders and the Davao City Police Office, Davao City bagged the Hall of Fame award as the most child friendly city all over the country for six consecutive years. This recognition is attributed to the countless efforts of PNP personnel to maintain a safe and peaceful environment to everyone most especially to the youth of Davao City, who are most vulnerable to numerous criminal incidents. Tactical Action Camera (TAC) is a project launched last December 1, 2015, under the leadeship of PCI MARK KIM B AQUINO, the former 2nd Manuever Company Commander of RMFB. 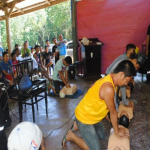 The activity was launched at 2nd MC Headquarters, Brgy Sat. Filomena, Cateel, Davao Oriental. The operationalization of the project was witnessed by the Company Advisory Council members during an actual police checkpoint operation. The project “TAC” or “Tactical Action Camera” is a new strategic approach in law enforcement to fully document the operation thru video and audio recording. This kind of approach shall also address the validity of every police operation, aid in the investigation process and review possible lapses of PNP operatives during actual operation. Also, it will provide easier access to the unit commander to have a real time update and situation. This project uses a Kevlar Helmet and a Go Pro Camera to be worn by police personnel in every conduct of police operations. 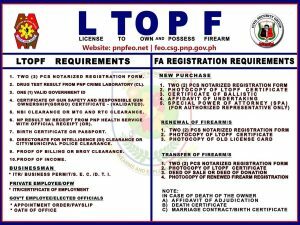 It can also be attached in the uniform of PNP personnel depending on the need of situation. The project have contributed to the significant accomplishments of this unit particularly in assessing and reviewing conducted operations. OPLAN IRON CITY dubbed as Integrated Revitalized Operation of Neighborhood-Watch of the Mega City is Davao City Police Office concurrent initiative to address all forms of illegal and criminal activities within its area of responsibility. It shall enhance and sustain regular conduct of static and dynamic police foot/mobile patrols operations along major thoroughfares and at densely crime prone areas of the city at any time of the day. It aims to further improve the delivery of public safety services in order to prevent crimes and maintain peace and order in the city. 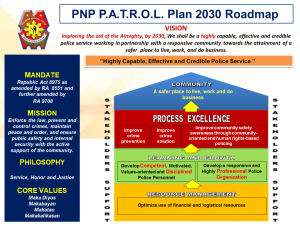 The Oplan Iron City’s main strategic concept is through the upgrade of the conduct of Police Integrated Patrol System (PIPS) which includes the reactivation of the “Police Auxiliary”. 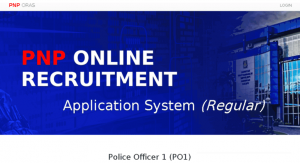 The police auxiliaries were directly recruited by the twelve (12) Police Stations of Davao City from among the bona-fide residents of the One Hundred Eighty-two (182) barangays with a maximum of Five (5) persons selected per Barangay. The auxiliaries were organized and trained, equipped and were given compensations. Devise an Effective Feedback Mechanism. 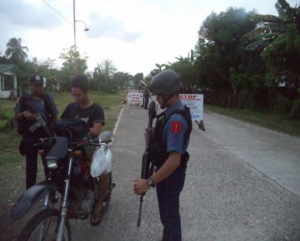 As part of the intensification of OPLAN IRON CITY, “Oplan Bulabog” was adopted as one of its strategic activities. It was implemented in May 25, 2017 two (2) days after the declaration of martial law by President Rodrigo R. Duterte. 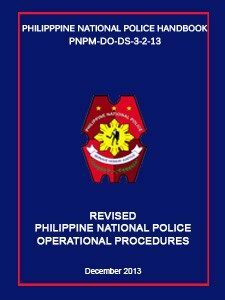 Oplan Bulabog is the Davao City Police Office action plan for the suppression of terrorism, specifically to contain the possible spillover of the Maute Terrorist Group to Davao City. 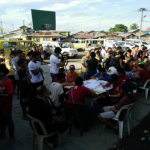 The Oplan Bulabog provided guidelines to be strictly adhered to by Task Force Davao and Davao City Police Office in conducting operation to target areas of suspected supporters/sympathizers of the Maute group. One of the purposes of this project is to prevent, control and suppress all forces of terrorism and criminality. 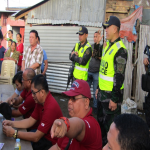 During the course of implementation of this project, reduction of crime incidents in Davao City was noted, with seizure of Most Wanted Person as well profiling of residents in the crime prone areas. 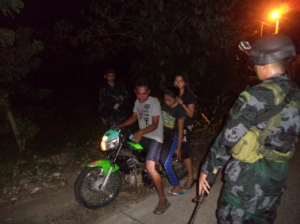 DCPO conducted several intel driven Oplan Bulabog operations to those barangays with presence of suspected individuals. 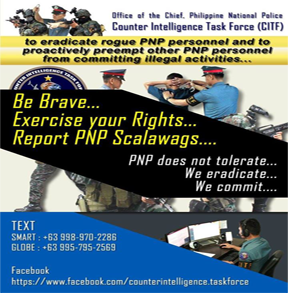 The Oplan Bulabog is a joint operation of the following government agencies: LGU of Davao City; PSSCC; Central 911; JTF HARIBON; 3RD IB Philippine Navy; Philippine Coast Guard; AVSEU11; Regional Mobile Force Battalion 11; RHPU11; Maritime Police; BFP; CIDG11; PDEA11; NICA11; NBI; Bureau of Immigration; CTTMO; and Task Force Davao. Covering the period from May 25, 2017 to December 29, 2017, a total number of 17,037 individuals were recorded as residents from the visited barangays; 2,595 as undocumented; 46 IDP resulted to 74 persons arrested during the 17 simultaneous operations which were conducted. Oplan Liwanag is a community based transformation and Intervention for Volunteers Submitted for Reform or VSR in the province of Compostela Valley. It is a joint project between the Provincial Government Unit of Compostela Valley and Compostela Valley Police Provincial Office (CVPPO) purposely to provide rehabilitation program to the rising number of drug surrenderers. 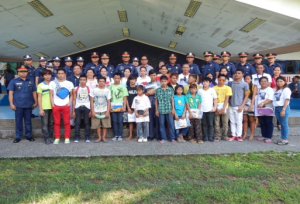 The PNP played a vital role in providing and assessing information as to who will undergo the program. At present, Compostela Valley has a total number of 16,536 Drug Surrenderers while there are 2,219 Voluntary Surrenderers who enrolled at the reformation program. 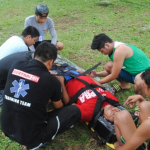 And there is a total of 1,846 who have already completed the 2-month Rehabilitation Program. Thereof, there are still 14,317 Drug Surrenderers who still need to undergo this project. The five (5) day Community Emergency Response Team ( CERT) Training spearheaded by the Davao City Central 911 started with the Orientation on the first day; second day is on fire behavior, tools and equipment with demonstration on using fire extinguisher; third day is introduction to Improvised Explosive Device and orientation by the personnel of Central 911 on the introduction to First Aid, Trauma & Medical Emergencies, and First Aid Techniques Emergencies, and First Aid Techniques; fourth day – Introduction to Light Search and Rescue and fifth day introduction to proper man carry, proper triage and application of bandage were given by the Central 911 personnel.